There is only so much you can do with celebrity endorsements. When it comes to Chips, they have to take a back seat to the celebrity in question. 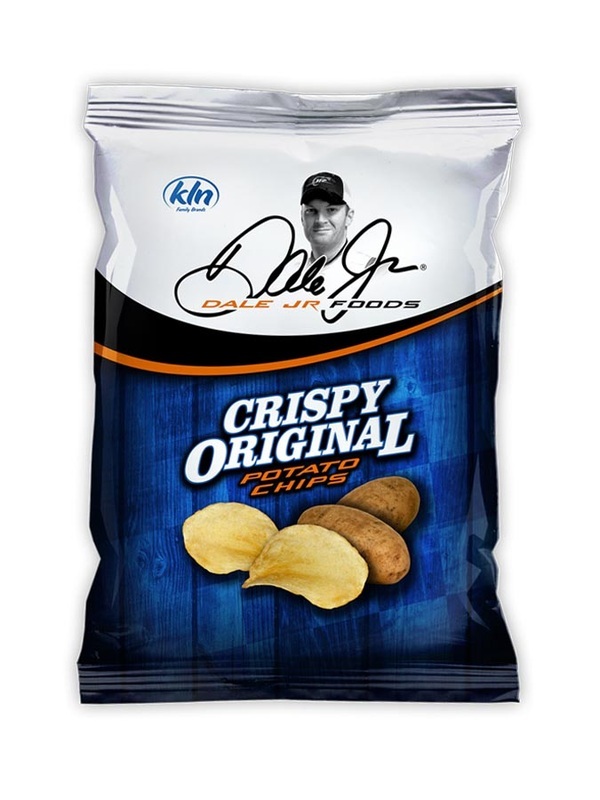 No-one would suspect that Dale Earnhardt Jr spent his spare time in his kitchen rustling up Chips for his racing buddies. The bottom half of the bag does what it should, advertise the contents in a modern way with flavor color coding and a graphic of the ingredients. The top half of the bag features the autograph and a photo of the man himself. It's all rather uninspiring, but in the marketing world this is where the packaging comes second. It's all about the celebrity in question. The largest Chip in the pack was around three inches and folded in half. The crunch lasted 15 chomps and it gradually turned from crispy and smashy to pulpy and mashy. This was however a freak Chip. The rest were light and crispy and did not sustain any sort of crunch after the initial bites. These Chips were sort of average in every way. Not very thick, but not too thin. Not too much bubbling, but a few broken bubbles were noticeable here and there. There was no visible seasoning and even the oil looked minimal. The color was pale yellow and a little transparent in places. A Nose Plunge Test gave nothing away. Hardly surprising really. The taste was a warm fluffy, jacket potato on a cold Fall evening, with a tiny blob of butter and a sprinkling of salt. The after-taste was of some sort of oily imitation food stuff.